I have been out and about … here are a few new finds for me! 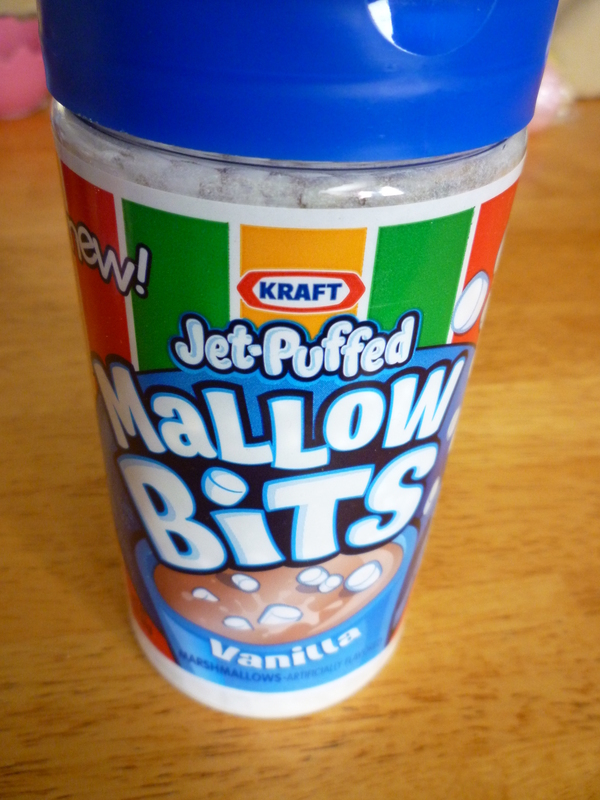 I thought that you may like them too ..
Mallow Bits … they are crunchy little marshmallows … maybe little bunny tales? I found this at Target. Easy Frost … frosting in a larger can … I’ll try it when I’m in a pinch … reminds me of whipped cream in a squirty can … frosts 16 – 24 cupcakes! This came from WinCo. Mini Cups… mini ice cream cones … you will see what I do with them very soon. I found them at Walmart. 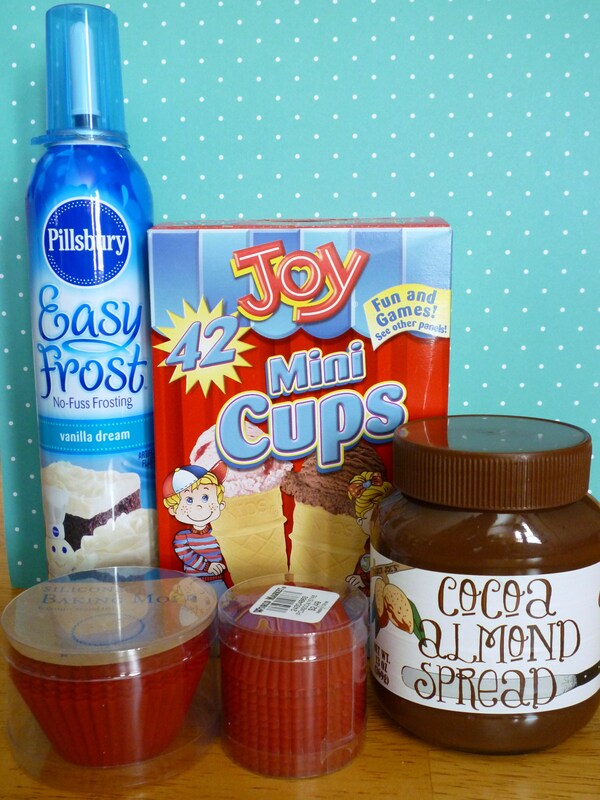 Cocoa Almond Spread … I have never tasted Nutella because I’m allergic to hazelnuts … this stuff is wonderful!!! From Trader Joe’s. Silicone Cups … I had never bought any before, due to storage, cost, etc. These came from Cost Plus World Market … $2.49 for 6 regular or 12 mini! 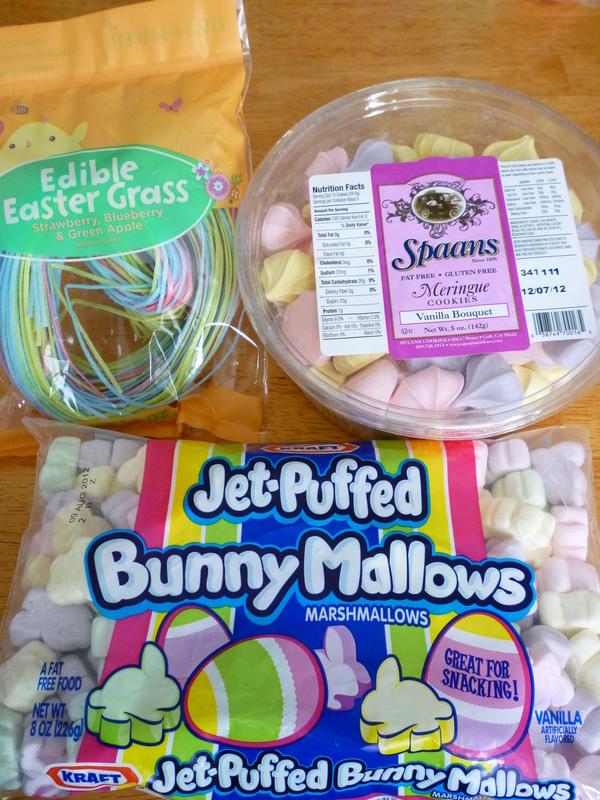 Edible Easter Grass … I just had to buy it. From Target. Meringue cookies … minis in pastel colors … I’m not exactly sure what I’m using them for, but I’m sure I needed them. I found them at Cost Plus World Market. Bunny Mallows … of course I had to have them. I saw them at Target and Walmart. 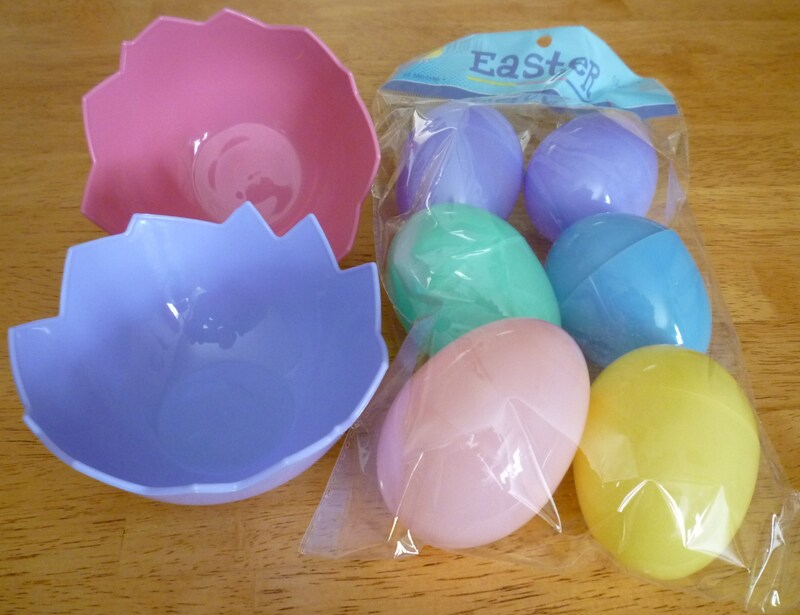 Egg Bowls … only $.99 at Michael’s! Plastic Eggs … nothing new, but I found them on my very first trip to Hobby Lobby. I can’t believe that I drove to the closest store … only 53 miles away! I guess I’ll drive anywhere for craft supplies! Have you found a wonderful item that you want to share? Just leave a comment! Cute things!!! Hobby Lobby has become my favorite store since moving to TN. I probably didn’t need to know about it … but now I have been to Hobby Lobby … it’s a good thing that I don’t live closer! Hobby Lobby is one of my favorite stores along with Michaels and Joann’s…I didn’t know what any of these stores were until I moved to Texas…don’t know how I lived without them now…and remember, you can always order online!!! Yes, nothing like going to the stores…it’s a real treat when you can get there. oh, I am sooooo envious! All those lovely things which I NEED (lol) but cannot get here in India. But if, then too many people would have them too and the novelty factor is off. So, I just keep looking at your lovely pictures. Thanks! I have a friend that visits family in Mumbai occasionally, where she has found candy molds and pretty foils. I believe that it was in a local marketplace. I will ask her for more info if you wish.